After skewering celebs at the Golden Globes, Gervais mocks his not-so-well-traveled pal in a new season of "An Idiot Abroad." 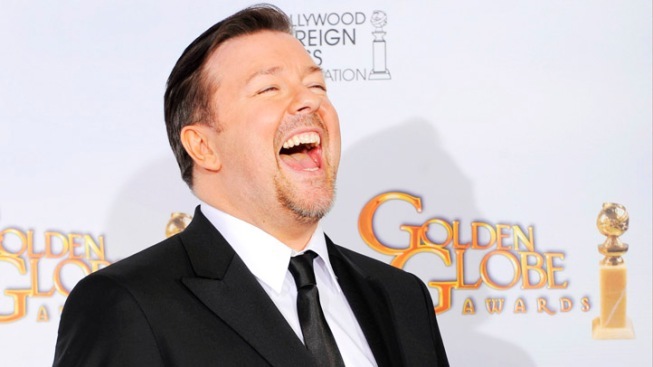 Ricky Gervais has gone from laughing at celebrities back to mocking his pal, Karl Pilkington. Ricky Gervais, as he proved again at the Golden Globes this week, thrives on the comic collision between celebrity and the seemingly ordinary. "I hope you enjoy the goodie bags and the champagne – and the gold," he taunted the high-living crowd. In “The Office,” he created the clueless David Brent, whose folly largely is driven by delusions of grandeur in which the grating mid-level manager sees himself as a top-flight comedian – with a captive audience. “Extras” punctured the pretensions of fame with its sharp juxtaposition of movie stars and the folks in the background. His upcoming "Life's Too Short" features a dwarf struggling to get acting jobs among bigger performers. But perhaps Gervais’ most impressive accomplishment in this realm is transforming a man who outward ordinariness masks an extraordinary oddness into the strangest of celebrities. His pal and comic punching bag Karl Pilkington is back for another season of “An Idiot Abroad” beginning Saturday on the Science Channel – marking a different kind of global adventure for Gervais. Pilkington, a radio producer, rose to a dubious form of prominence in 2005 via a series of podcasts featuring him spouting bizarre theories on evolution and other topics as Gervais and “Office” co-creator Stephen Merchant mock him. The podcasts, which set a Guinness Book of World Records mark for most downloads, became fodder for the animated “The Ricky Gervais Show.” The setting proved appropriate for Pilkington, a cartoonish, round-headed figure who believes “The Flintstones” accurately portrays the Stone Age. Gervais and Merchant put him in front of the camera last year for the first season of “An Idiot Abroad," in which Pilkington visited the Seven Wonders of the World – only to be pranked at each turn by his buddies, who set him up, from afar, for unexpected detours. He got cow dung smeared across his head in India, wrestled in Mexico and got “kidnapped” in the Mideast (which quite possibly leapfrogged the line from comedy to cruelty). Gervais and Merchant call Pilkington after each misadventure and laugh at his complaints, petty and otherwise. There have been much talk of Pilkington’s weirdness being an act and suggestions that he’s in on the joke. But “Idiot” goes a long way toward dispelling such notions, showing him as the eccentric he apparently is. On the road, Pilkington comes across as the British equivalent of the ugly American, bristling in discomfort and disbelief at the larger world outside the place he normally occupies, the peculiar universe that is his mind. There are moments, though, when his hangdog look disappears and he actually appears briefly to enjoy himself, as when he took a dip in the Ganges – even if the experience fell short of spiritual rebirth. “Idiot” works as comedy but also is an effective travel program. Even if Pilkington squirms nearly every minute of his journey, the viewer gets a fascinating ground-level look at parts of world – from slums to the Amazon jungle – infrequently seen on TV. This season of “An Idiot Abroad” is subtitled “The Bucket List,” with Pilkington ostensibly setting his own agenda. The latest series of episodes, previews suggest, is shaping up as a real-life TV version of the be-careful-what-you-wish-for comedy classic movie "Bedazzled," the brainchild of an earlier great British comedy duo, Peter Cook and Dudley Moore. Gervais and Merchant, of course, deviate from the itinerary. Pilkington, who pines to swim with dolphins in Australia, is instead tossed in with sharks. He goes to Africa to meet a gorilla (as fans know, he’s obsessed with all things simian) but is first put to work helping build a shelter. Part of his dream trip along Route 66 involves “wing-walking” on an old bi-plane.